Home > Shop By Brand > BLACKFIRE Pro Detailers Choice Car Care Products > BLACKFIRE Interior Detailer 32 oz. 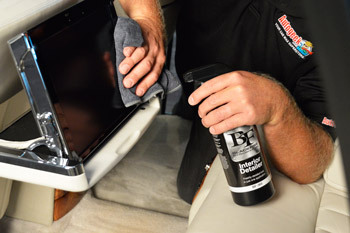 BLACKFIRE Interior detailer can be used on all interior surfaces – including leather, vinyl, plastic, and even LCD navigation and television screens! 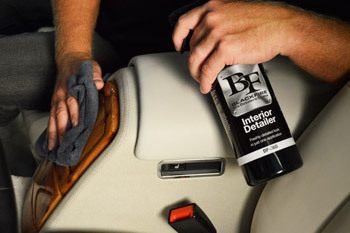 BLACKFIRE Interior Detailer removes dust, light dirt, fingerprints, smudges and more and is safe for use on all interior surfaces – including leather, vinyl, rubber, plastic, and navigation screens. During cleaning, BLACKFIRE Interior Detailer also leaves behind a layer of protection that guards against UV rays, keeping your interior as new as the day you got your car! BLACKFIRE Interior Detailer is ideal for professional detailers that either don’t have the time to do a strenuous two-step interior detail, or would like to offer a more affordable option for their clients. BLACKFIRE Interior Detailer does, essentially, the work of two products in just one application and lets you move on to the more exciting aspects of detailing. BLACKFIRE Interior Detailer provides that “just detailed” look to your interior surfaces every time it’s used – and if half the time! This product works well as a quick cleaner that leaves a little protection.If your interior is new this is the ticket.If you have an older interior I would recommend McGeeâ€™s 37 interior protectant.It does the same thing with more protection and leaves an improved appearance in my opinion.